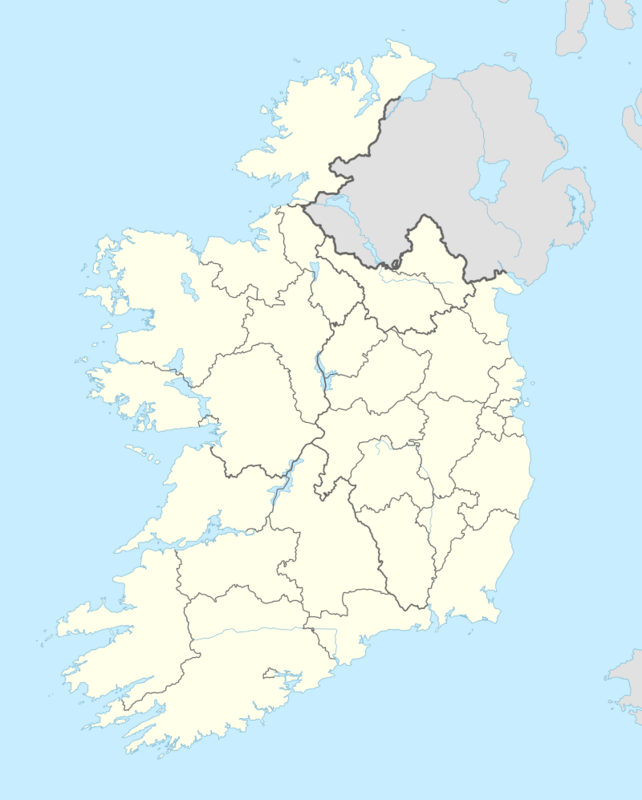 Craughwell (historically Creaghmoyle, from Irish: Creachmhaoil) is a village and townland in County Galway, Ireland. The name is also used as a surname, properly Ó Creachmhaoil, though often anglicised as Craughwell and Crockwell. The surname was largely unknown outside of the southeast of County Galway until the end of the 19th century when émigrés established families which still thrive in Newfoundland, Bermuda, Cornwall, Ohio and Berkshire County, Massachusetts, among other places. The name is composed of two Irish words: 'creach', meaning in this case "plunder", presumably in reference to herds of cattle, which were often targets of thefts and cattle raids amongst the Gaels. The usual Gaelic word for cattle is crodh, often Anglicised in place-names as crow, although the words cro, crocharsach, and crò are all connected with sheep, sheep enclosures or meadows. An alternate etymology of creach is related to craig, and creag, and the English word crag, refers to a rock (with which word it rhymes), or the bare rock crest of a hill (related words are cruach, for a mountain, pinnacle, or a rounded hill that stands apart...or for any type of pile, or heap, and 'cnoc', for a hill or eminence); and 'maol', which is a word for a round-shaped hill or mountain, bare of trees. It is anglicised as mull, and is common in Irish and Scottish place names such as the Mull of Kintyre. Gaelic spelling rules require that maol, following creach, be lenited; that is, an h is inserted after the first letter, providing the first letter is a consonant (and not an l, n, or r). This h makes the preceding consonant silent, or changes its sound (mh, or bh, for instance, are silent or sound like an English v or w). Gaelic spelling rules also require that, with the first letter lenited, the last vowel should be slender (an i, or an e). As both vowels in maol are broad (a, o, u), an i is inserted after. These two changes alter the sound of maol (rhymes with mull) to mhaoil (rhymes with uell, or well). The sound of the two word together, therefore, sounds to an English ear like Crockwell, or Craughwell, and it is Anglicised thus (the Gaelic personal names Seán (John) and Seamus (James) became Iain and Hamish in Scotland by similar means). The pioneer of Irish placename studies, Patrick W. Joyce, speculated that the name in Irish was Creamhchoill, meaning "garlic wood". He was obviously unaware of the local spelling and pronunciation but confirmed in a later work that the village was called Creachmhaoil in Irish. The town currently has three pubs, a Garda station, a pharmacy, a bookies, furniture stores, post office, hairdressers, two service stations, a lawnmower shop, and a pizzeria and fish and chip shop. The village of Creachmhaoil celebrates its connection with the Gaelic poet Anthony Raftery and Anjelica Huston, and provides the surnames of notables including American painter Douglass Crockwell  the Bermudian parliamentarian Shawn Crockwell, JP, MP, the late Bermudian FIFA-certified football referee and Honorary Life Vice-President of the Bermuda Football Association Carlyle McNeil Eugene Crockwell, Bermudian footballer Mikkail Kristopher Crockwell, Bermudian cricketer Fiqre Crockwell, English cricketer Leslie Crockwell, Guinness World Record holding rower Matthew Craughwell, and American author Thomas J. Craughwell.